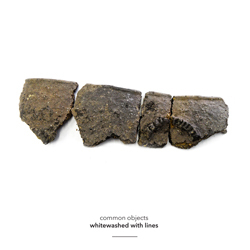 Common Objects is a group comprised of John Butcher (saxophones), Angharad Davies (violin), Rhodri Davies (harps), and Lee Patterson (amplified devices and processes). Their double-disc album, "Whitewashed with Lines," is taken from two performances, a year apart; "Cup and Ring," from The Mining Institute, Newcastle upon Tyne in 2014, and "Repose and Vertigo," from Tunstall Chapel, University College, Durham in 2013. This is some of the most gorgeous abstract music I have heard this past year. There are two approaches on this album. "Cup and Ring" is a Davies composition, based on European primitive art forms of marked cups and rings for notes. By using this method Davies builds on the model established by composers like John Cage, where compositions are built by chance methods or notations, playing between rigid forms and personal expressions. "Cup and Ring" is a 57-minute masterwork of atmospheric sounds, punctuated by designed notations of winds, strings and electronics, and above all, leads the listener on a journey that builds slowly but is rewarded throughout by textures, movements, and flavors. "Repose and Vertigo" is alternatively an improvised work, with similar sounds, but more interactive, less designed. Butcher's staccato like sounds really penetrate the smoothness of the electronics. Silence provides key breaks, like pauses from movement to movement. It is a great testament to the musicians that the sounds are always consistently engaging and builds upon itself to create a unique whole. Excellent work; one of the finest releases of the past year.